Today marks the 20-year anniversary of the day Rodney King was beaten by the L.A.P.D. The brutal assault is an infamous moment in American history and it led to a string of events. Besides King and the subsequent trial of the officers accused of using excessive force, the King saga more or less involved numerous other incidents including the shooting of LaTasha Harlins, the beating of Reginald Denny, and the resignation of L.A.P.D. police chief Daryl Gates. It also was ultimately the straw that broke the camel’s back and led to the 1992 L.A. Riots. Besides being a moment in American history, the entire ordeal has been immortalized in rap lyrics through the years. 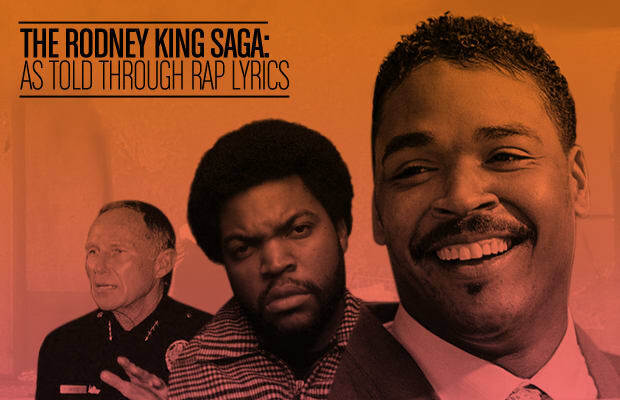 Which is why we decided take a look back at the series of events that began with King’s beating and ended with him winning $3.8 million in a civil suit, through the lens of various rappers who’ve made Rodney King references or songs inspired his story. So please, can’t get all just get along?